Think that a day in the life of a London museum director is cold, quiet, and austere? Think again. Giles Waterfield brings a combination of intellectual comedy and knockabout farce to the subject in this story of one long day in a museum full of scandals, screw-upsŠand more than a few scalawags. At the beginning of The Hound in the Left-hand Corner, Auberon, the brilliant but troubled director of the Museum of British History, is preparing one midsummer's day for the opening of the most spectacular exhibition his museum has ever staged. The centerpiece is a painting of the intriguing Lady St. John strikingly attired as Puck, which hasn't been shown in London in a hundred years. As the day passes, the portrait arouses disquieting questions, jealousies, rivalries -- and more than a few strange affections -- in the minds of the museum staff. As guests and employees pour in, the tension rises -- and Auberon himself has the hilariously ridiculous task of keeping the peace, without losing his own sense of reality as well. 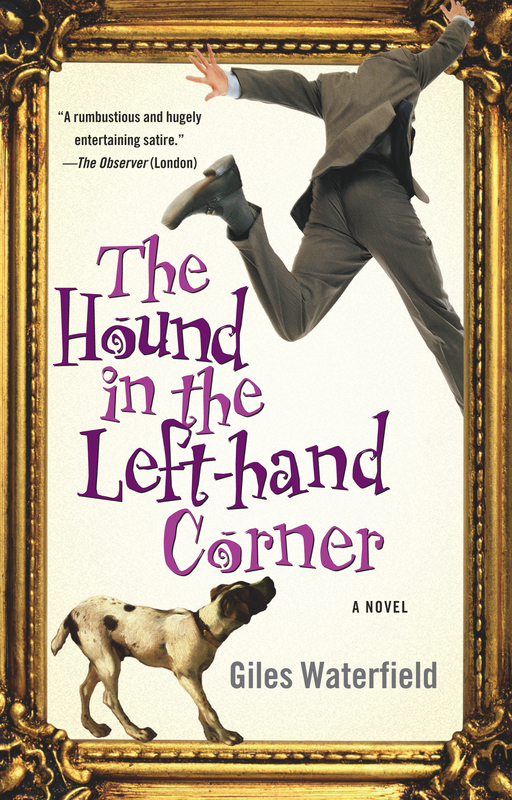 For everyone who loves the farce of David Lodge and Michael Frayn, or even the Antiques Roadshow, the fast-paced, hilarious satire of The Hound in the Left-hand Corner is sure to delight and entertain. At 0300 hours the guard on patrol duty on the first floor is due to walk through Exhibition Suite One. In his central control room in the basement, with its cameras watching every public gallery, the staff corridors and meeting rooms and potential entry points (though not quite yet the offices), the exits, the delivery yard, the stores, the four streets around the building, John Winterbotham, Head of Security, can survey everything always. Now he turns to the camera covering Exhibition Suite One. He trusts his men, more or less, but Ralph, who is patrolling the ground floor at this moment, is a new boy. At 0300 hours precisely, the door to the first room opens and Ralph, small, neat, and dark, appears. He looks conscientious but nervous, as though an assailant might emerge from behind a showcase. He knows he's under surveillance. He looks around the whole room in the approved manner and presses the security button, which records his timekeeping. John Winterbotham is reasonably satisfied, though it's a pity none of his young recruits has his own military background. On the morning of Midsummer's Day of 2001, BRIT is asleep. It was called the Museum of English History until last year, but with the millennium it was felt that a livelier name was needed and that "English" had exclusive connotations, so "BRIT" (subtitled "The Museum of British History") came in instead. At least, it seems asleep from outside: no passerby could sense the dim security lights glowing in all the rooms, or the sound of solitary steps along the marble and parquet floors. Anyone glancing at the portico, with its ten enormous columns and monumental staircase, might think it the temple of an abandoned cult. Only a set of cords above the front door, waving in the night breeze, suggests it's ever inhabited. Anyone who could enter the closed double bronze doors with their reliefs of Britannia and Saint George would reach a completely still entrance hall. It is a vast domed room, with screens of columns on four sides and a stone coat of arms above each screen. Opposite the entrance a gigantic staircase leads to the upper floor. Each corner of the room is occupied by a massive statue: Art, Industry, Learning, and Valour. During the day this is the busiest part of the building, constantly filling and emptying, babbling with a thousand tongues and a dozen languages, with inquiries for the lavatories and the cafeteria and Michelangelo's David and the Magna Carta, with hordes of near-rioting French schoolchildren and attentive Japanese. At night, empty and lit by pale security lights, its cavernous heights offer no welcome. The room has perplexed generations of museum directors and designers. "So imperialistic," they said after the Second World War, "so huge, how can we persuade ordinary people it's a place for them?" "How can we make it look swinging?" they had cried in the sixties as they tried to disguise the dimensions under false white ceilings and walls. At the beginning of the new century, the management team agonizes over its authoritarianism and social élitism. Young Ralph seems tempted to linger. He must be spoken to. A good guard concentrates on the job at hand. That job's about security, not looking at objects. The only reason to look at any specimen on display is to check that it's in place and undamaged. After a pause or two, Ralph walks through the room at the correct speed and reaches the second exhibition room at 0302, the scheduled time. John glances at the camera covering the ground floor front. His man there is Norman, long-established, no problem, an ex-Welsh Guardsman like John himself. Ralph is currently patrolling the Gallery of Early English History: from the Stone Age to the Norman Conquest. It was the first gallery created when the museum was founded. A shaky government was persuaded that the museum would kindle patriotic fervor by celebrating England's political liberty, maritime endeavor, industry and science, literature and the arts, agriculture, trade, warfare. By the beginning of the twenty-first century it is one of the largest and most popular museums in the country, visited by over two million each year. There's a great deal to see. Even the building, long derided as pompous, is now admired. On the South Bank of the river behind Lambeth Palace and Waterloo Station, it was paid for in 1902 by an ambitious purveyor of wine and spirits. He hoped the building might turn him an earl but, not being a gentleman, had to be satisfied with a viscountcy. Viscount Haringey wanted a proper building like the Natural History Museum, but up-to-date. He commissioned, from the architects Lanchester and Rickards, a palace in the quintessentially English Wrenaissance style. Built in red brick and Portland stone, its twenty-five-bay facade boasts a tower at each end, adorned with balconies at three levels, and unexpected finials on the hipped roof. The huge coat of arms of England over the main entrance has been a favorite target for paint-throwing political protesters ever since the museum opened. The Gallery of Early English History is long. Having walked its eighty yards at a steadily increasing speed and glanced at some of its four thousand exhibits, visitors imagine they've seen the whole museum. They don't realize that beyond its marble doorcase, over three floors, stretch the Gallery of Medieval History, the Gallery of Early Modern History, the Tudor and Stuart galleries (sponsored by a firm of interior decorators), the Georgian and Regency galleries, two Victorian galleries, the Gallery of the Industrial Revolution (sponsored by a Japanese car production company), the Gallery of English Painting and Sculpture (supported by a major American trust), the London Gallery, the Gallery of Empire, the Gallery of World War (no sponsorship available here), the Gallery of Women's History, the Gallery of Technology and Science, the Discovery Room, and a number more, quite a number. The attendants are used to comforting visitors who, turning the corner and gaining their first view of the apparently eternal Gallery of Medieval History, turn pale, grip their bags convulsively, plead for escape. But there is none. "Museum fatigue can be a problem," admits the director. At three in the morning nobody's suffering from museum fatigue. Only, perhaps, the security staff, who've been patrolling the building since midnight. In the Gallery of Early English History the slowly pacing Norman sees the yards of gallery stretching into a distant penumbra, interrupted only by the security lights glowing every few yards. The axe heads and sherds, the fragments of old shoes and fruit, the busts of Roman emperors, the illuminated manuscripts, slumber like rocks on the ocean bed. When John arrived at the museum he had a great deal to do: a spot of tyranny was essential. Discipline had gone out of the window: the attendants would lounge around in gabbling groups ignoring the public, morale was rock bottom. One pair of attendants, a man and a woman and both married, were suspected of mistaking night duty for night pleasure. ("Too right those two like to be on the same floor," somebody said in the mess room, and everyone guffawed.) At night some of the men drifted completely out of control. While they were supposed to check the offices of the senior staff, they were not meant to settle down on the furniture or peer at confidential memoranda. The curators hated having their space invaded by unseen strangers at night. It was realized that rules had to be tightened when someone scrawled "Old Jenkins likes shagging goats" in the trustees' lavatory (Sir Hubert Jenkins, authority and frequent lecturer on Agriculture in Early Medieval England, was director until three years ago). There's no more nonsense under John's rule. He keeps a tight grip on everything that goes on. The control room is the heart of the institution. Unless the plant and the objects are safe, none of the activities the curators are so proud of (which personally he often finds a waste of time) could take place. Few of the staff know how intimately he surveys their activities, and might not like it, but the system is essential for good security. One day he hopes to be able to hear what is being said in all these public and staff spaces, to ensure that there are no breaches of confidence in conversation, but nonsense about civil liberties makes this difficult. He's mentioned once or twice to the Head of Admin irregularities of conduct he's noticed on the screen or on his walks around the building but the man's never seemed receptive. When John left the army he doubted any civilian job (outside the police force) was worth doing and was skeptical about the museum. But when he realized that though the staff numbered only three hundred, there were over a million objects with a total value of £400 million for which he'd be responsible, his interest quickened. Now in his newly modernized control room, known to his staff as the Pentagon, he can survey his banks of cameras, the line of computers recording the action, the electronically guarded record files, the constant presence of a uniformed man, and feel that here at least, in this disordered muddle they call England's capital city, discipline and order rule. He'll be going home shortly for some kip before returning for one of the busiest days in the museum's year. No family now that June's moved to Lichfield and the children have left home, so no need to spend time with them. His new girlfriend's pretty understanding about his irregular hours (though she was a bit too eager to be invited to the dinner that night, which of course was not possible, really went on about it). He looks at the day schedule for 24 June 2001, shaking his head. All OK, at least in principle. The thing I'm most worried about is the Grand Pageant, which involves large numbers of extras, children from nearby schools (what are they doing there anyway, still up at eleven? ), complicated lighting effects, and some tiresome actors and actresses. I won't be able to go home again until three the following morning, at the earliest. No problem about that. But I really must leave now -- I should have left at midnight. Ian Burgess, his deputy, comes into the room and looks at him inquiringly as though wondering why he hasn't left. Secretly, John's never happy leaving Ian to play boss at night and is sure he'll make a bad mistake one day, but he can't be on duty all the time. Ian just isn't tough enough, too soft with the staff -- and the public, too, for that matter: you have to keep them in order, especially the types you get in south London. "Keep an eye on the new boy," John tells him, "and watch the screens for the exhibition galleries, especially the room where that new picture is hanging -- belongs to the Chairman, absolutely vital no one goes near it." Then he leaves. Ian rolls his eyes at the other guard in the control room (also nonmilitary, and his ally) and looks at the screens. Ralph has moved into the Gallery of Women's History, still on time. If he does look at one or two objects as he passes, and even stops for a moment, it does no harm, Ian considers. He and the boss disagree on that point, as on many. It's time for Ian to settle into the supervisor's office next door, although he'll be off himself at four; it never seems his territory when John's around. Ian's hoping for promotion to another institution soon, and will be glad to be number one, free to introduce a human working-with-the-public approach. It will be good never to have to see John again. John passes through the entrance hall on his way to the staff entrance. He likes the hall at night, quiet, grand, powerful, its majesty undisturbed by crowds, the lights subdued, everything in order. If only, he sometimes thinks, it could always be like this. This evening, during the royal visit, the entrance hall and the Great Hall next door will look as they should look. Then indeed, with the highest in the land visiting the museum, the men in their black and white according to the code, the ladies richly dressed and jeweled, the movements of guests and staff prearranged, every action planned in detail and carried out by trained professionals -- then this mighty building will be used as it should be. He's developed a proprietorial affection for the place; it appeals to something deep inside him. Lingering for a moment, he savors the sense of responsibility the great empty space gives him. He shivers a little at the thought of the day ahead. Could anything go wrong? No, of course not. He must get some rest. The Observer (London) A rumbustious and hugely entertaining satire.